WHAT DOES A SHUTDOWN MEAN? 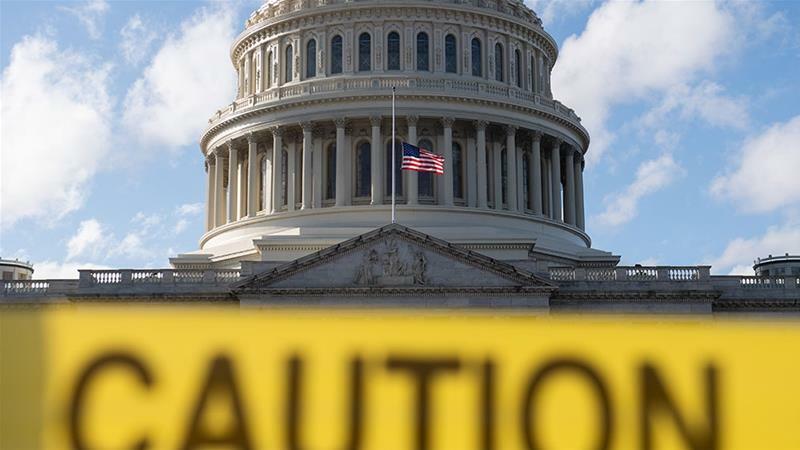 Donald Trump has invited top congressional leaders to the White House on Wednesday for a border security briefing, the first between the US president and Democratic leaders since before a partial government shutdown began a week and a half ago, US media reported. According to the Tuesday reports, which cited unnamed sources, Trump will host House and Senate leaders from both parties for the briefing. Other details were not released. The briefing would come a day before House Democrats are set to vote on their recently announced plans to end the shutdown, which does not include money for Trump’s border wall. Democrats in the House unveiled two bills on Monday to fund shuttered government agencies and put hundreds of thousands of federal workers back on the job. One bill would temporarily fund the Department of Homeland Security at current levels, with $1.3bn – well below the $5bn in wall funding Trump has requested – for border security through February 8 as talks continued. It would also include another measure made up of six other bipartisan bills – some that have already passed the Senate – to fund the departments of Agriculture, Interior, Housing and Urban Development and others closed by the partial shutdown. It would provide money through the remainder of the fiscal year, to September 30. House Democrats plan to pass the bills as soon as the new Congress convenes on Thursday, one of the first acts after Democrats took control, according to an aide who was not authorised to discuss the plan and spoke on condition of anonymity. Whether the Republican-led Senate, under Majority Leader Mitch McConnell, would consider the bills or Trump would sign either into law was unclear. McConnell spokesman Donald Stewart said Senate Republicans would not take action without Trump’s backing. Trump spent the weekend saying that Democrats should return to Washington to negotiate, firing off Twitter taunts. White House officials, including his departing chief of staff, had indicated that Trump’s signature campaign pledge to build the wall would not be fulfilled as advertised. The outgoing chief of staff John Kelly told the Los Angeles Times in an interview published on Sunday that Trump abandoned the notion of “a solid concrete wall early on in the administration”. But Trump revised his aides’ comments to state that he really still wants to build a border wall. In an interview with Fox News, aired on Monday, the president said he is “ready, willing and able” to find a solution to the political impasse that led to the shutdown. Democrats under House leader Nancy Pelosi were all but certain to swiftly approve the package in two separate votes on Thursday. They would take place after the election of a new House speaker, a contest Pelosi was expected to win as leader of the new House majority. The White House has not commented on the House proposal. Republican senators left for the holidays refusing to vote on any bills until all sides, including Trump, were in agreement. The politicians were frustrated that Trump had dismissed their earlier legislation. The president has not said he would veto the Democratic legislation if the bills were to land on his desk. But the idea of clouding Pelosi’s speakership only emboldened Trump, the officials said. A prolonged crisis could hobble House Democrats’ ability to launch their agenda, which included investigations of the president and oversight of his administration, including Russian interference in the election. The partial government shutdown began on December 22 after Trump bowed to conservative demands that he fights to make good on his vow and secure funding for the wall. More than 800,000 federal workers are furloughed or working without pay. Last week, federal employees sued the US government over the requirement that workers deemed “essential” must work without pay during the shutdown. In the past, Congress has approved back pay for federal workers, but the American Federation of Government Employees, which announced the lawsuit on Monday, called the requirement to work without pay “inhumane”.